Sometime in the late 80s a young man suddenly appeared at Vancouver Magazine, then on the corner of Richards and Davie. The young man was an “aw shucks” sort of guy I often found in the corner office of the editor, Malcolm Parry whom, then, we all called Mac. It would be disingenuous on my part not to attribute fully my success as a magazine photographer in Vancouver to the fact that I was under the wing of Parry. Many others were including quite a few writers, photographers, illustrators and art directors of note who since the 70s and 80s broke out on their own. I often chatted with the young man and when he found out I had been assigned to photograph local fashion designer Catherine Regehr he offered to assist me with the styling. I wrote about it here. Few who have followed the career of the young man are aware that he wrote many articles for the magazine downstairs from Vancouver Magazine, Western Living. Coupland championed the grass-free lawn garden and revealed to us all the charm of the English trug. In September 1987 Parry launched a wonderful issue of Vancouver Magazine that had all sorts on National Geographic-style photographs. It was also the first appearance of Coupland’s Generation-X. In today’s Malcolm Parry column in the Vancouver Sun (Town Talk) Parry tells us about Coupland’s start in Toronto for a magazine called Vista. Following my excerpt of that column there is Malcolm Parry’s bio in the Vancouver Sun. Read it carefully and if you can read between the lines you will know what I have always known. I was not the only one under Mac’s wing. FRANK’S A LOT: Perhaps self-made billionaire Frank Stronach will visit Douglas Coupland’s exhibition at Toronto’s Museum of Contemporary Canadian Art. If he does, the Magna International firm founder should be applauded for launching the West Vancouver-based writer-artist on his journey there. It was 1988 when then-27-year-old Coupland joined the editorial staff of Vista, a magazine Stronach had funded to the tune of $12 million. As an artist, it amused and pleased him that Stronach’s daughter Belinda, then 22, would drop by to hang valuable works by Andy Warhol and suchlike on Vista’s office walls. 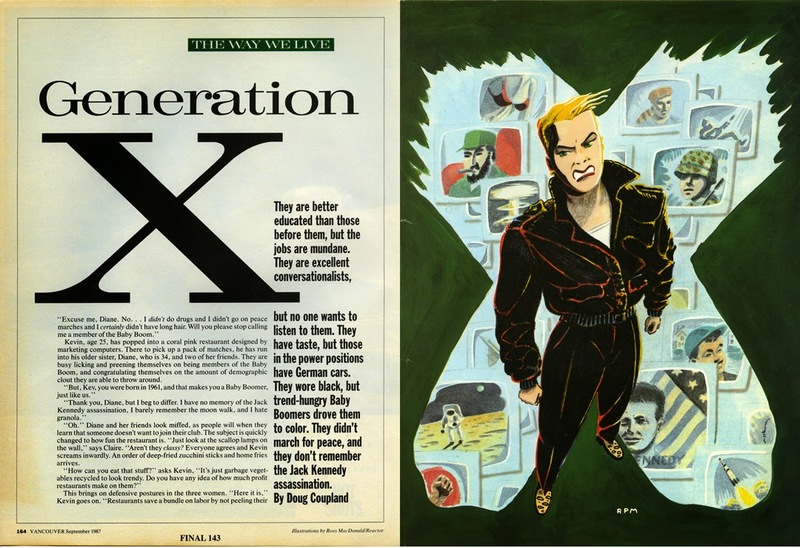 Meanwhile, Coupland buckled down in the workstation he called a “veal fattening pen” to develop a feature-article-turned-comic strip he called Generation X. The magazine closed after two years. By then, though, Coupland had retained a New York literary agent who successfully pitched the catchy title to St. Martin’s Press. The subsequent 1991 book lit the fuse on its author’s stellar career. The title, along with Coupland-conceived terms like McJobs, became global catchwords. Such consequences would doubtless please the quirky Stronach, as visiting Coupland’s exhibition may, too. Malcolm Parry was born and educated in England, where he studied civil engineering and worked as a part time musician playing the saxophone. In Canada he worked as a commercial and industrial photographer and later as the advertising and public relations manager of a telecommunications manufacturing division of New York based General Telephone and Electronics International, now the Verizon Corporation. He also freelanced extensively as a writer and photographer for regional and national newspapers and periodicals in Canada. In 1970 he was the founding editor and later publisher of the Vancouver-based business periodical B.C. Affairs and founding editor/publisher of its spinoff periodical B.C. Industry Reports. 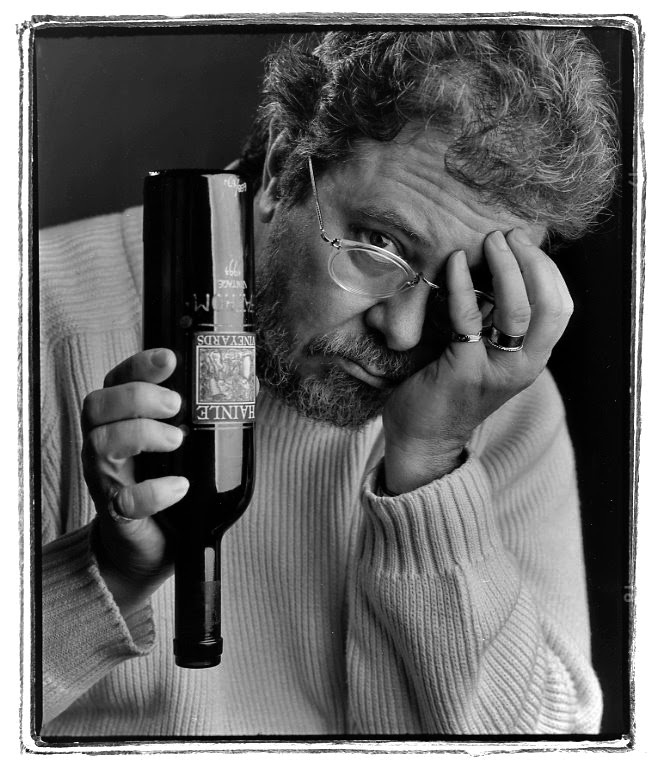 In 1974 he was founding editor and later publisher of the city monthly periodical Vancouver Magazine. He remained editor for two terms totalling 15 years, during which time he, the magazine and its contributors won many regional and national and some international awards. During that period he was founding executive editor of Edmonton and Calgary Magazines and of the B.C. business periodical Equity. For briefer periods he was editor of Western Living magazine, which publishes editions in B.C. Alberta Saskatchewan and Manitoba, and was also editor of a Vancouver city affairs publication titled V.
He was founding editor of the Toronto based business magazine Vista, where he won a national award for art direction. While Malcolm Parry was editor of Vista, journalist Mark Budgen and I were assigned to do two stories. For them we flew to Argentina and Uruguay. In my closet I have a black Generation-X Vista T-shirt. In 2000 LML Payments Sytems, an international cheque cashing software company based in Vancouver sent me to the US to photograph people in the organization for their 2001 Annual Report. I had to go to Washington DC, Phoenix and Dallas. I decided that to properly shoot this I would take my medium format camera (and a second one as backup) plus my almost compact studio lights, a powerful (then) flash unit (a Norman 200B) for on location shooting, plus the necessary light stands and heavy duty tripod. To carry all this I brought a collapsible two-wheeled cart. Perhaps it was the stress of the logistics but before I left for the US I developed shingles around my waist. It was painful for me to even sit in my airplane seat. In Phoenix it was 117 Fahrenheit. Between Dallas and Washington DC I realized I had left my Norman 200B (battery operated) in a Dallas office. 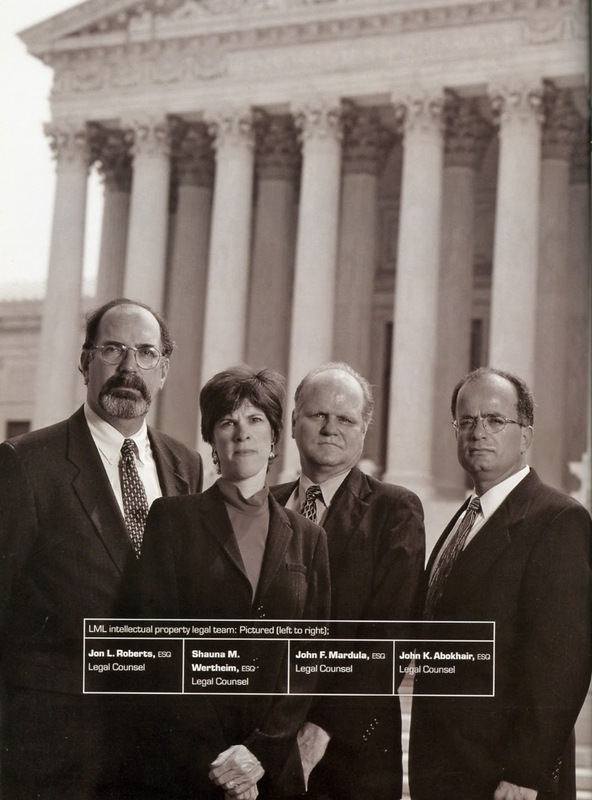 I needed it for Washington DC where I was to photograph four lawyers in front of the US Supreme Court. They were to be the daunting faces of the company should anybody want to infringe on their patents. The Norman was shipped to DC by courier and I got it in time. By then I was suffering excruciating pain. At the Supreme Court I was pleasantly warned that I could take as many pictures as I wanted as long as I took them on the other side of the street. With a long lens I was able to compress the building and my Norman 200B worked just fine. With the relief of having successfully finished my job I decided I wanted to see some of the local galleries. Two of them were the Corcoran Gallery of Art and the National Gallery. I decided to go to the Corcoran first. I entered the gallery with all my equipment. I told the guards of my mission to go to the National Gallery and I asked them if I could store my equipment. Without even inspecting it they smiled at me and allowed me to wheel my stuff into a room. I remember all kinds of Singer Sargents but the painting to remember was Frederic Edwin Church’s 1857 Niagara (7½-foot-wide) painting. A few days ago I read in my NY Times that the Corcoran Gallery is closing and most of its collection is going to the National Gallery. On Thursday, the National Gallery announced that almost 6,500 works had been taken into the overall collection so far. The museum’s holdings of 1,215 American paintings alone will grow by 226, including beloved works like Frederic Edwin Church’s 1857 “Niagara,” a 7 ½-foot-wide blockbuster that Nancy Kay Anderson, the curator of American and British paintings at the National Gallery, refers to as “our ‘Niagara problem” because it is so important and so large that paintings at her museum will almost certainly have to move or go into storage to accommodate it. The process that has been underway behind closed doors at the National Gallery — one large museum essentially digesting another of considerable size — is, in its scope and particulars, unlike anything an American museum has undertaken before. Chances are that I will never ever get shingles again. But my troubles had not ended. Once on the airplane ready to return to Vancouver a storm started. We stayed on the tarmac for five hours (we had to help ourselves to water as by some strange law the flight attendants could not serve us while on the ground). The airplane finally returned to the terminal and I slept the night on a long seat. Everybody was shouting and clamoring for attention. I decided that would not help. The woman behind the desk agreed and rapidly got me a seat in the first plane out. Unfortunately I did not make in time to Vancouver when the folks of the US magazine Better Homes and Gardens was going to shoot our garden for a spread. The spread did appear. But I felt a bit left out! When I attend a movie at a local Multiplex I am offended by the stink of fast food, loud soundtracks and that constant repetition to “enjoy the show”. I cannot understand why we must be exposed to commercials. When I leave a Multiplex I am smothered in guilt. That is not the case when I go to a good local concert. And this particularly applies to the longstanding tradition of Wednesday Noon Hours at the UBC School of Music. The school features concerts by top notch musicians (many are instructors and or principals in varied BC orchestras) for $5. 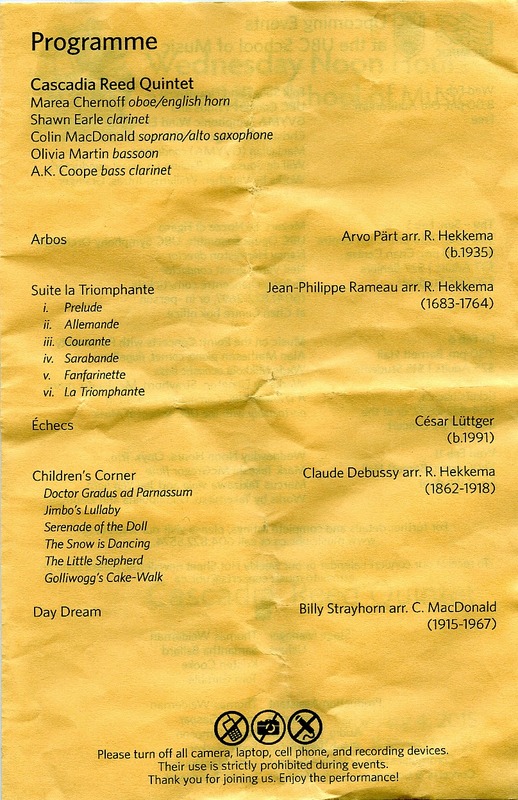 The varied and most pleasant program included one wonderful gem. This was the arrangement of Jean Philippe Rameau’s Suite la Triomphante. It was refreshing for my friend Ian Bateson and I, regulars of the Early Music Vancouver, Pacific BaroqueOrchestra and Stile Moderno concerts to listen to baroque music not (and I repeat not!) played by authentic instruments of the time. Of particular delight was to listen ever so clearly in the quintet the sound of that unusual instrument (usually buried in the back of a symphony orchestra) of A.K. Coope’s bass clarinet. 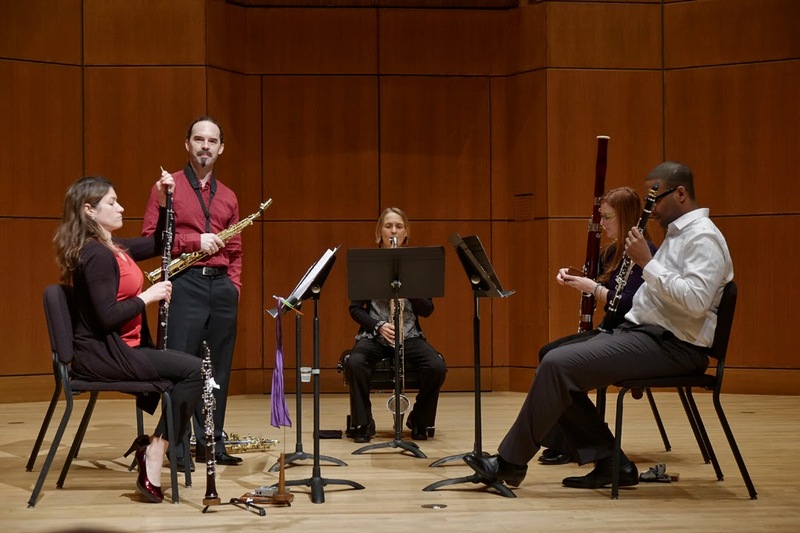 This clarinet has an unusually high upper register but can still go lower than a bassoon. Part of the La Triomphante was movement Fanfarinette which for many years was the opening theme for the popular afternoon CBC Radio show Disc Drive hosted by JurgenGothe. Any program that includes anything by Arvo Pårt and finishes with a jazzy (Colin MacDonald on his alto saxophone) Day Dream by Billy Strayhorn has to be unusually good. And it was. 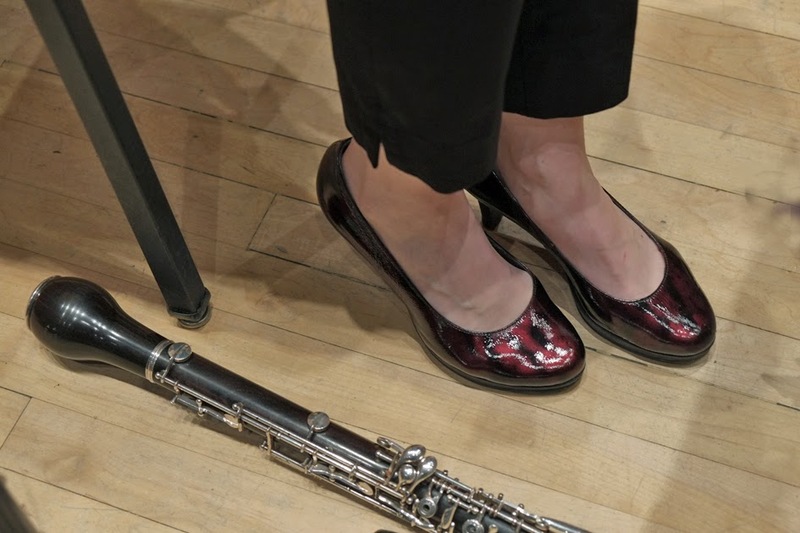 We left refreshed (without guilt) and I had enough time to photograph Chernoff’s beautiful shoes. I suspected they may have been an expensive purchase at Gravity Pope. I was wrong. Chernoff, who plays as the principal oboist for the Kamloops Symphony bought them there! Colin MacDonald explained that the inspiration for the Cascadia Reed Quintet came from the Dutch group Colefax. So much good stuff in dance and in music comes out of the Netherlands. It is not generally known that many of our city musicians and dancers have studied there. So many inhabitants of this city complain that it is a “no fun” city. I think otherwise. And consider that having fun here is not always even expensive. Because Bateson and I arrived early we went for a walk. I pointed out to my friend that in a city where it rains a lot there are few covered walkways at UBC. 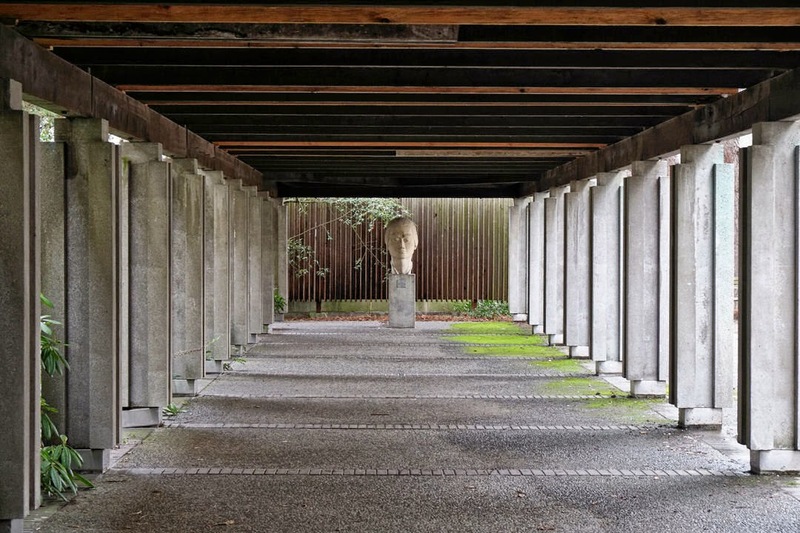 One of the rare ones is outside the UBC School of Music and leads to the Belkin Art Gallery and the Frederick Wood Theatre. 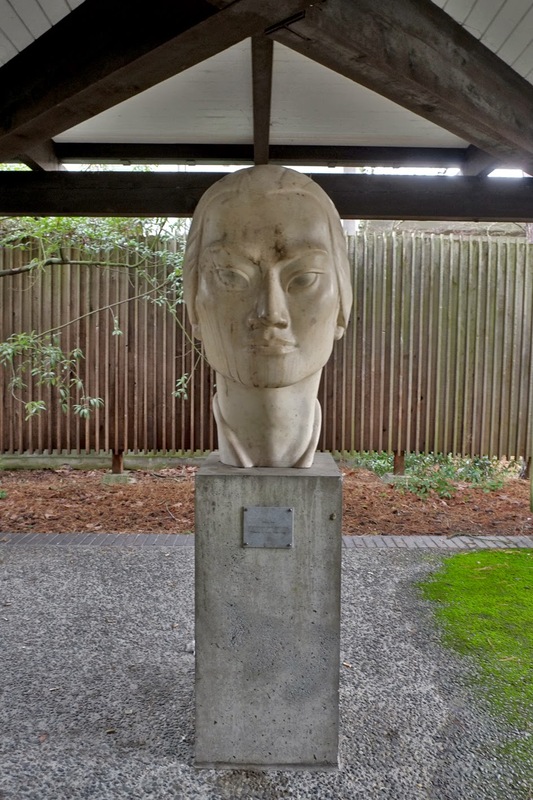 At the end of the walkway there is a replica sculpture, Asiatic Head, by Otto Fischer-Credo. It would have to be sheer coincidence that he was not dancer Cornelius Fischer-Credo's father. Cornelius Fischer-Credo now lives in Florence. I wrote about him here and here. ciao Alex, wow blast from my past. W've been living in Florence for the past 11 years. Ironically 'm moving back to Vancouver this summer. 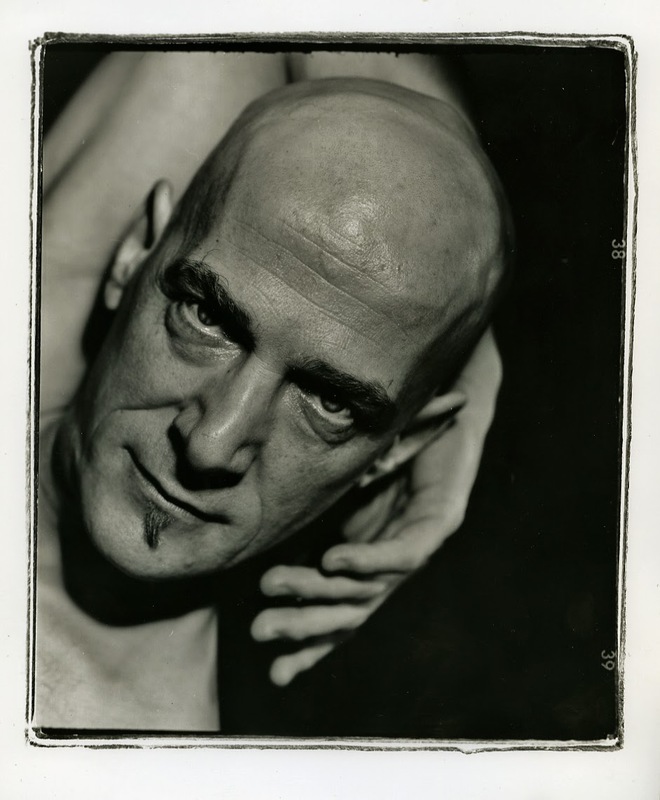 Yes Otto was my father, born in 1890, he was a sculptor, studied at L'ecole Des Beaux Artes in Paris in the teens and early twenties (his painting instructor was Gaugain). He lived and worked in Asia for 8 years, China, Japan and mainly Manila. there's an interesting blog about architecture in Manila that speaks about him that I can send you. He and my family were living in New York city (the west village) when WW2 started and they were forced to go back to Germany. He was indoctrinated into the Third Reich and did war art (even a bust of Hitler that I recently found out still exists). After spending 5 years in a French prisoner of war camp in Algeria, he did restoration work for a number of years in Bonn and then in the late 50s my whole family immigrated to Vancouver. He died in 1958. There you have a brief history of my father Otto. I will send you the link. You can be much more alone with other people than you are by yourself, even if it's people you love. That sounds all mixed up, doesn't it? Anybody turning on a TV and randomly tuning to Gone With the Wind would find it almost impossible not to linger or even see it to the end. There are some films like Gone With the Wind that are iconic for certain generations. My guess is that both of my daughters (in their 40s) would linger on Star Wars. 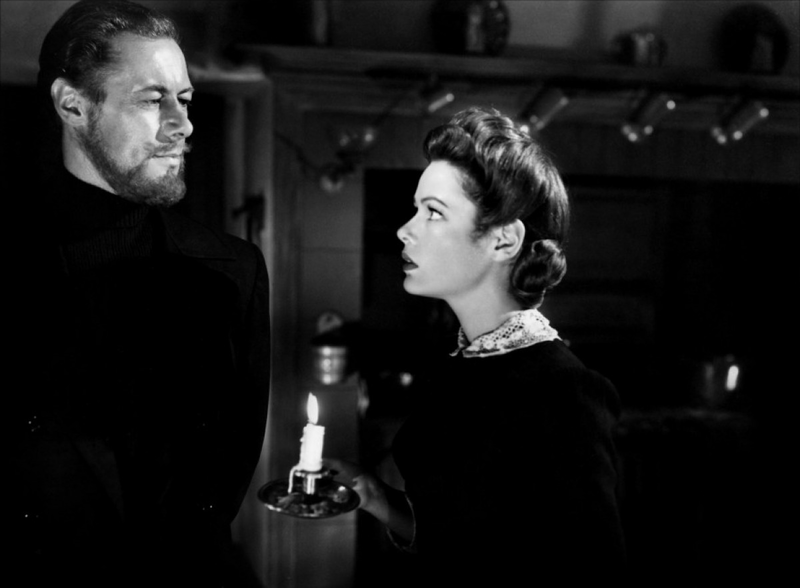 It may have been not too many years after The Ghost and Mrs. Muir was released in 1947, directed by Joseph L. Mankiewicz and with Rex Harrison, Gene Tierney, George Sanders and a very young Natalie Wood, that I saw the film with my parents in Buenos Aires. There is one scene that became embedded in my brain and I anticipate it every time I see this film. Mrs. Muir, an old woman now sits at a wing chair and picks up her hot milk. You see her hand pick it up and then her hand droops and the glass falls to the floor. 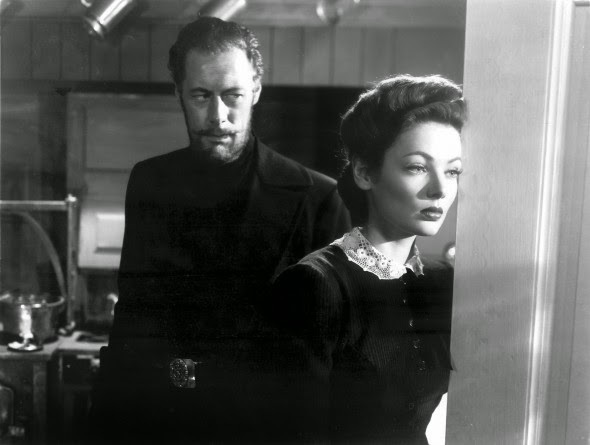 Rex Harrison’s voice is as memorable as Tierney’s unearthly beauty. After seeing it once I saw it again years later with my mother, then with my wife and then with my two daughters. Lately I gave the film to my eldest daughter who lives in Lillooet and she saw it one evening when her sister Hilary and daughter Lauren when they were there for a visit. Just a few days after a dinner of homemade pizza (Calabria Bakery dough) Hilary, Lauren, Rosemary and I sat down in the den to see The Ghost and Mrs. Muir. This film is one of my Gone With the Wind type iconic films. I enjoy it every time and wonder where all those actors with wonderful voices have gone to. All I have to do is remember Sean Connery and Audrey Hepburn in Robin and Marian to almost grieve at the loss of the great voices (well Connery is still with us). But for me the real wonder is to watch Lauren, 12 and to realize that I was a lot younger when I saw The Ghost and Mrs. Muir and how wonderful that 65 years later there we are seeing it again. What would my mother have thought of Lauren her great granddaughter? Strange to see a film in which an older actress plays the very young Natalie Wood. 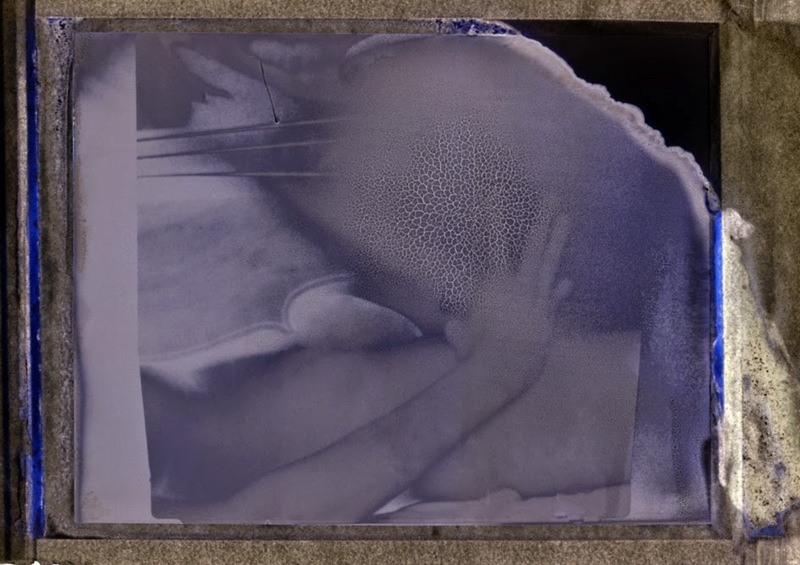 When we first saw the film she was an unknown. Next on the iconic lineup will be Laura. The complete script for The Ghost and Mrs. Muir. As an early teenager, 15, I fell in love with Anna María Ramos in Nueva Rosita, Coahuila in Mexico. I was in the 8th grade in a room that also accommodated, in parallel rows, perpendicular to the large blackboard, the 7th and 6th grade, My mother was our teacher. The school, I believe had two additional teachers and rooms for the other classes. When I first gazed on the apparition, she had large black eyes and dramatic eyebrows; I knew I first had to know her name. Once I did I would think of the name and daydream. The name became the apparition of my delight. It was impossible to separate the name from the person. Anna became her name or perhaps it was the other way around. I was not yet aware of Plato’s forms so I had no idea on how naming things and persons is an exclusively human (very human) endeavour. To know more about this read here. I have a new friend. His name is Curtis and he plays a baroque bass. He is most pleasant, he is intelligent and he is a warm person. But there is something that sets him apart from all the people I know. He is either unable or unwilling to name things. He told me that if he ever had children they would remain unnamed. Could the naming of things somehow make them ours and his reluctance to not name be a demonstration of a free spirit willing to live and let live? Curtis came to Vancouver (he lives in the US) a few months ago and when I asked him if his bass had a name he told me no. It had to be my friend Patricia and her bass Nicolo who finally baptized Curtis’s bass Amelia suggesting that some basses are female and others male. I have another friend, a baroque cellist and her cello seemed to be unnamed. In facebook postings I would read “Cello and I …” I enquired and I was told that cello was called Grace. I must now confess that when I photographed a fine female librarian with her cello I did not ask for the cello’s name. Certainly, the pattern shows, that it must have one. I wonder. A Mission In Africa Or On The Deck Of A Ship? Twice in my life I almost made a decision that may have saved me from the perils of the one I must face now. That is the peril of having things. While at a Roman Catholic boarding school in Austin we were often asked if we felt we had a vocation. This was Catholic school recruiting talk to lure us into becoming a Brother or Priest of Holy Cross. I must admit that for just a few seconds, every now and then I thought about it. I was attracted to the concept of simplicity and not owning too many possessions. I had seen how a few brothers had been summoned and told they were being sent to a mission in Africa or Brazil. I had seen how easy it had been. They might have sent a few letters to their relatives, then packed a suitcase with a few black socks, black slacks, a couple of black brother vestments, a few white shirts, a sweater and a bible. And that was that. Then I would look at my Pentacon-F with its 50mm lens and I knew I wanted an 80mm portrait lens. I also wanted a pair of black cordovan Bostonian loafers and… the list got bigger. A few years later ( I was 22) I was on the deck of the Argentine Merchant Marine ship Rio Aguapey (I was the only passenger on a free ticket back home to Veracruz after two years as an Argentine Navy conscript). We were in the port of Santos in Brazil. The deck was infested with insects and the docks looked filthy. As we shoved off the insects disappeared and I was on board a clean ship, the smell of paint was comforting, with no earthly obligations or commitments. For a few days the idea of joining the Merchant Marine became attractive. Those people on the dock in Santos had no choice but to stay and live there. Here on board I would be free of it all. But after talking to my friends, the young officers, it became obvious that they had poor family lives and a terrible prospect of ever having a wife that they would be loyal to. Still the compactness and the fact that my cabin had only my necessities (including a book on the philosophy of Spengler) and nothing more persisted in being attractive to me. Now in February 2015 the end looms much nearer than on that deck at Santos. I have asked my eldest daughter Ale in Lillooet to make a trip, early spring so that she and her sister Hilary can look around the house and make a list of what they might want to inherit. Rosemary has found our will and we will make a new one. I will write little essays explaining the framed photographs on our walls and paste them behind. Both my daughters were born in Mexico but as strange as it may seem the oldest, Ale feels Mexican while the younger feels Argentine. This would help them decide who wants what. Perhaps we will put our house on the market in the coming fall and move in spring. We will make sure that wherever we move our two cats can follow us. It will be tough to get rid of so many books. One sad decision I thought I would have to make became less so. Rosemary asked me if we should heavily prune the trees on our garden to give my roses and her perennials more necessary light and sun. I answered that this was not necessary. My beloved roses and I are on the same boat of decline. The ones that survive will go to gardens of friends. Those that don’t will remain in my memory until that memory goes. Meanwhile I think of those pair of “what ifs” and wonder where I would be now. Would it be a mission in Africa or on the deck of a ship? I have a nagging suspicion that my third choice was the best. Link to: A Mission In Africa Or On The Deck Of A Ship?